one happy little crafter: The Bingo one! I have gone for the bottom line - ribbon, use the word Joy and die cut. This very sweet image comes from our sponsor this time, The Paper Shelter, and is coloured, as ever, with the promarkers. The sentiments are my own work. 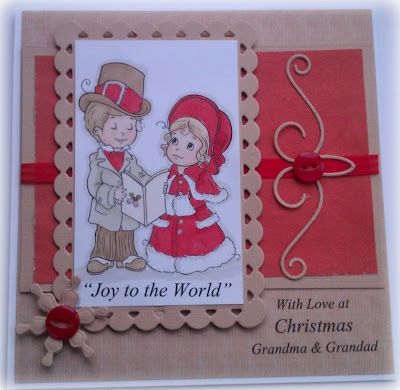 The die cuts are the Nellie Snellen die that the image is mounted onto, also Marianne Snowflake and Memory Box fremont crest die. buttons and ribbon from stash.